My daughter wants her Grandpa (90) at her wedding. I don’t. He’s frail, confused, unpredictable, and needs constant attention. I want to make my daughter happy, but not ruin the wedding for me. Do I have to invite my father? Yes. It’s your daughter’s wedding and she wants Grandpa there. Here’s the solution to managing your father’s behavior and enjoying your day during this wonderful event. 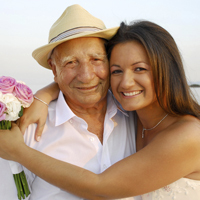 Hire a home health aide to dress and groom Grandpa and care for him at the wedding. Have the aide visit Grandpa a few times before the wedding so that he knows her. Ask the nursing home staff for the best size/type clothing to make it easier for the aide to dress and toilet him. Arrange for someone to pick up Grandpa and the aide and take them back. Keep his wedding visit short (1-2 hours maximum) to keep him from tiring and becoming disruptive.